Wendy’s launched its first value menu in October 1989 — seven items ranging from a junior bacon cheeseburger to a garden side salad to a small Frosty, all priced at 99 cents. It was the first volley of a revolution that changed the fast-food industry in America. “I think the Wendy’s 99-cent value menu was a very innovative approach to pricing that has stood the test of time and created a way of life for fast-food-chain customers,” said Darren Tristano, executive vice president of Technomic, a food-industry research firm in Chicago. And with payroll taxes rising and consumer confidence falling, it’s time for value again. Restaurant chains such as Wendy’s and Taco Bell are making over their value menus to balance customers’ dwindling paychecks with rising food costs. “In tough economic times, that’s when value is even more important,” said Denny Lynch, a spokesman for the Wendy’s Co. in Dublin. The fast-food value menu is rooted in value theory — understanding how and why people value some things more than others. In 1989, “value” meant fast food that cost less than a buck, and Wendy’s set the standard. Instead, Wendy’s offered customers the predictability of the same value items every day. “That turned out to be a big hit that resonated with consumers,” he said. Over time, the definition of fast-food value changed. Consumers decided they also wanted quality and variety for their dollar. “It’s not just ‘fill me up’ anymore,” Lynch said. That spelled pricing pressure for restaurant operators. So they juggled their value menus, aggressively promoting the lowest-cost items, cutting portion sizes, switching to lower-cost suppliers and moving high-cost items to other parts of the menu. In mid-2005, Wendy’s experimented with raising the prices of some value-menu items above $1 to compensate franchisees for rising food costs. For example, Wendy’s raised the price on its junior bacon cheeseburger to $1.29 from 99 cents, according to The New York Times. The pricing move confused longtime Wendy’s customers and was partly responsible for a slump in sales, securities analysts said at the time. Wendy’s went back to a 99-cent value menu within six months. A few years later, Wendy’s competitor Burger King priced its double cheeseburger at $1, even though franchisees complained they were losing money on the sandwich. The National Franchisee Association sued Burger King on behalf of the franchisees in 2009. Franchisees settled the suit two years later, winning not higher prices for the cheeseburgers but more say in future value-menu pricing. Meanwhile, the prices of food, utilities and labor have continued to rise. “All restaurants are dealing with food price inflation,” said Technomic’s Tristano. Last year’s drought, considered the worst in half a century, is adding to food and fuel costs. New health-care mandates for employers, beginning next year, also could drive up labor costs, Tristano said. So in recent years, some Wendy’s franchisees took liberties with their value menus, raising prices for some items above $1. That meant one restaurant might have charged 99 cents for a Jr. Cheeseburger Deluxe, but at a different location, the same sandwich cost 30 cents more. Inconsistent marketing messages, including price disparities at its restaurants, caused Wendy’s to lose market share and traffic in its “price/value” segment over the past 15 months, Emil Brolick, the company’s president and CEO, told investors during a recent conference. 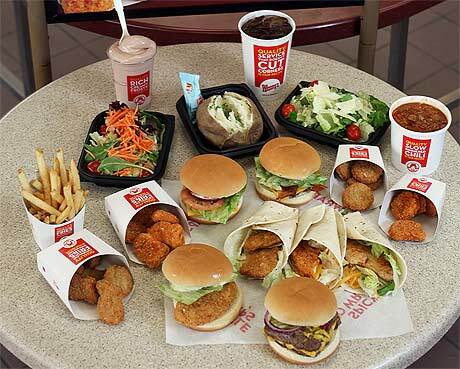 On Jan. 2, Wendy’s relaunched its value menu as the Right Price Right Size menu — 18 items ranging in price from 99 cents to $1.99. Breaking the 99-cent barrier of previous menus could give Wendy’s and its franchisees flexibility to deal with rising costs. KeyBanc Capital Markets analyst Christopher O’Cull praised the Right Price Right Size menu in a recent research report for its potential to make value pricing more consistent across Wendy’s restaurants. This potential has yet to be realized. Wendy’s can’t dictate the prices that franchisees charge for their value-menu products, Lynch said. The only 99-cent item that remains from Wendy’s original value menu is the small Frosty, Lynch said. Whatever the evolution of the menu, it continues to resonate with at least some customers. David Head of Columbus likes Wendy’s new value menu. Head started with one sandwich and french fries on a recent afternoon, then went back for a second sandwich. This entry was posted on Thursday, February 21st, 2013 at 2:50 pm and is filed under Economy, Fast Food, Financial Activity, Flavor, Food, Health & Wellness, Ingredient, Menu Development/Innovation, Menu Trends, Price. You can follow any responses to this entry through the RSS 2.0 feed. You can leave a response, or trackback from your own site.